When middle school puzzle master Sam and history wiz Martina win a contest for a summer trip across the US, they discover they've been drafted into something vastly more extraordinary. 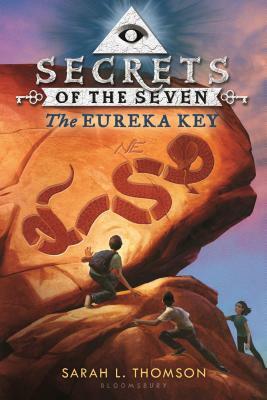 Joining another kid on the trip, Theo, a descendant of George Washington himself, they must follow clues to find seven keys left behind by the Founding Fathers. Together the keys unlock Benjamin Franklin's greatest invention--a secret weapon intended to defend the country. Each key is hidden in a unique location around the U.S., protected with puzzles, riddles, and traps. This has kept the weapon safe . . . until now! Gideon Arnold, a dangerous descendant of the infamous Benedict Arnold, is on the chase. In competition with Arnold and his thugs to reach the artifacts first, Sam, Martina, Theo, and readers must use their wits to solve ingenious puzzles, escape death-by-booby-trap, and, by the end of the series, save our nation by uncovering many of its greatest secrets. Sarah L. Thomson is an award-winning author who has published more than thirty books for young readers, including the Secrets of the Seven series, Deadly Flowers, and Dragon's Egg. Sarah lives in Portland, Maine, with her daughter and her two cats. Her daughter helps with inspiration, and her cats help by lying on the piece of paper she needs most.